It was a pleasant enough day when I set off. So much so that I removed the gloves and woolly hat from my rucksack and didn’t bring a coat. Then the sun went in. By the time I got to SMS it was bloody cold and I was sat there, hoodie done up and scarf round neck, when Steg and Baz arrived. Baz remarked that all the Burnley fans he’d encountered were at least our age, or older, which I’d thought too. We were puzzling about our line up with Pellè in for Big Vic. 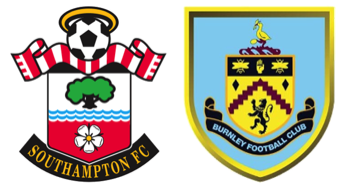 Burnley play a fairly standard 4–4–2 with local lads Vokes and Ings up front. Were we going to match them up? Burnley opted for black and grey away kit. I thought it looked like Gestapo uniform, but I’ve spent the last month watching ‘The World at War’ so I may have been alone in making that observation. Burnley won the toss and turned us round so Saints were attacking the Chapel End. I still couldn’t work out what our formation was – it was fairly fluid but it seemed our wide men, Mané and Tadić, were playing in front of Davis and Morgan, but behind Long and Pellè. Interestingly, the match report in yesterday’s Independent showed Saints as 4-2-2-2! Saints first attack saw Bertrand surge forward with his cross headed behind for a corner. Dušan took it; the ball was headed out towards Morgan. He volleyed the dropping ball but his shot went well wide. On 9 minutes Fraser went down. The booing from the Archers suggested Vokes may have clattered him but after watching the incident on MOTD it looked accidental. As he cleared the ball, Fraser’s legs slipped from under him. It is a long way down from that height. He fell awkwardly on his shoulder and his legs collided with Vokes. He was treated for 4 minutes before leaving on a stretcher with, apparently, 2 injuries. His place was taken by club captain Kelvin Davis. Both keepers were given huge ovations by the crowd. Bertrand was causing Burnley plenty of anguish with his energetic runs forward. On 15 minutes he combined with Long to send Pellè into the box. Most of the 30,000+ crowd were willing him to stick it away but he lost control of the ball and Heaton pounced on the loose ball. Saints were still misfiring in the final third. Long was sent away down the right but his cross drifted harmlessly behind. Then the normally reliable Toby hit a long forward pass that evaded everyone in red and white and ran through to Heaton. For a few minutes, Burnley seemed to have the upper hand. First Ings shot wide but moments later Vokes hit a clean shot that Kelvin did well to turn away for a corner. Saints survived this period of pressure but I was surprised to hear that Sean Dyche thought they should have had a penalty. Saw nothing at the time but I did watch MOTD where both pundits agreed with him. I’m sorry, but what I saw was Fonte tackle Boyd. The ball had been cleared by the time Fonte’s boot collided with Boyd’s. Never has been a foul – never will be. The referee got that one right – thank you. The value of Long was demonstrated on 26 minutes when he hared after Pellè's pass. Heaton sprinted from his area and was forced into hacking the ball into touch. From the throw Bertie crossed but Heaton claimed it. Saints then reclaimed the ascendency with a period of sustained pressure. Eventually the ball found Morgan whose shot deflected away for a corner. Davis’s cross was headed clear but Clyne ran onto the ball and fired over. There were attacks at either end. On 32 minutes Dušan pressed the Burnley defenders forcing Boyd to put the ball out but the officials gave a goal kick. Saints then attacked through Pellè but he misplaced a pass instead of shooting. In the next move he tried to play a simple sideways pass but skied the ball and possession was lost. Nothing seemed to be working for Grazi but to his credit he kept working. On 37 minutes he helped move the ball wide for Tadić. His cross found Clyne on the opposite side of the box. The full back let fly but pulled his shot. It went between Pellè's legs but reached Long who slotted it home from close range. 1-0. Saints continued to press. On 40 minutes Mané broke down the right and crossed to Pellè. His flick hit a defender and fell to Heaton. On 42, a free kick by Tadić found Fonte lurking at the back post. He knocked it back only for Pellè to fire a shot against the bar and away. The striker’s head was in his hands – again. But Burnley were still very much in the match and a quick counter saw Kelvin make a great save to keep out Ings. On 43 minutes Steg arrived with the half-time coffee. (I was shamed into paying for it this week. Baz says it is his turn next). Saints ended the half winning a series of corners as shots were blocked and crosses hoofed away. Fraser’s injury meant 5 minutes extra time was played during which both Davises were in action. First a flying header from Steve went just over and soon afterwards Kelvin tipped a Vokes header over. HT 1-0. Tadić was replaced by Victor at half time. He sat alongside Schneiderlin allowing Davis to play further forward. It began to look like 4-2-3-1 but the fluid formation allowed both Mané and Long to go beyond Pellè as required. Davis too was joining the attacks and he had the first chance of the half, firing into the side netting. Then Burnley moved forward with menace allowing Ings to carry the ball behind Bernard. I just love watching Toby defend. He stood up, hands behind his back, and blocked the shot. Ings went wide to recover the ball but his shot was claimed by Kelvin. Both sides were moving the ball well and it became a fascinating game. All 4 full backs were heavily involved in most of the good things that happened. I knew Trippier was a decent player but had not realised just how important he is for Burnley, taking most free-kicks and corners. Clyne and Bertie were our major providers. On 53 minutes the ball was laid back to Long who tried to curl one into the top corner – but missed. Saints hearts were in mouths again on the hour when Long was flattened and stayed down. Thankfully he was soon up and running around. Burnley were still getting forward. Boyd had a shot blocked and, from the resulting corner, the ball dropped to Mee who fired high over the bar. Then Arfield attacked down the right but Toby again kept his cross from coming in. On 66 minutes, Barnes pushed Clyne over and the ref waved play on. Saints attacked for the next 3 minutes until they won a corner – but Barnes was not booked. Mr East had clearly decided to keep his cards in his pocket. Saints enjoyed more good possession creating another chance for Pellè which he fired straight at the keeper. 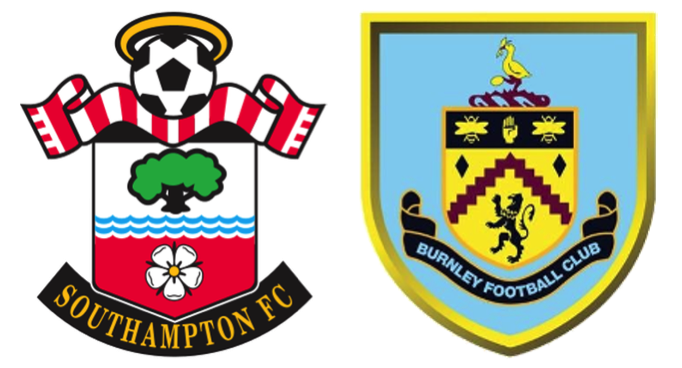 On 74 Burnley made their first change; Jutkiewicz for Vokes. On 77 minutes a defender handled Mané's shot giving us a free-kick in a dangerous position. Toby struck it but the ball went too high. Burnley got away with a few dodgy tackles including a clear foul on Long that went unpunished. Immediately Toby was punished for what looked a clean tackle. Bah! Referees huh? At least Shackell had the good grace to head over when he met Trippier’s free kick. Burnley’s next attack ended with Arfield firing over. Then on 82 minutes they brought on Wallace for Barnes. There was a lovely cameo of what Big Vic is all about when he carried the ball across the park with Burnley players bouncing off him. Must be like trying to tackle a tank. As time ran out, Saints seemed content to retain possession but one set of passes saw the ball played back to Kelvin. It clearly went behind the goal line but, with the assistant not up with play, Kelvin was able to boot the ball away. On 86, Long left Mee for dead down the right and provided a great cross. An on-form Grazi would have buried the header; the current one didn’t get enough on it. Then a foul on Morgan gave Saints another chance to put the ball into Burnley’s box. Before the kick was taken, Sordell replaced Ings. Then Long was pushed over in the box and he turned to see the uninterested referee running away. Credit to Burnley for keeping going. In the final few minutes both Jutkiewicz and Wallace fired wide of the mark before Mr. East brought the game to a conclusion with 3 more points added to our total. It made for a happy 52nd birthday for Ron and sent another big crowd home happy. I was so happy I got a Chinese takeaway for our supper! Steven Davis had his best game for us in a long time. With our bench looking stronger than it has for ages, there are flair players who might displace Davis in the starting XI but, if he continues to perform at this level, there is no way Ron can drop him. 9/10.